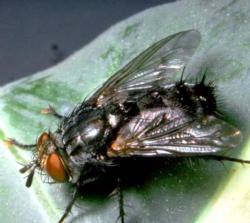 House flies can be considerable nuisance pests as well as carriers of animal and human pathogens. Management of house flies is an important part of any animal operation and an Integrated Pest Management (IPM) program for house flies is recommended. An effective IPM program includes a method for monitoring (measuring) changes in adult house fly activity on an animal facility. When house fly activity is low, measures to reduce house fly activity are generally limited to “maintenance measures” in preparation for the next period of increasing house fly activity. When house fly activity is increasing, animal facility operators determine appropriate measures to reduce house fly development and adult activity at the facility. If monitoring results indicate that adult house fly activity has exceeded a pre-determined action threshold above which nuisance or disease transmission is expected, then animal facility operators must take immediate action to reduce the number of adult flies. Under a true IPM program, house fly mitigation measures are driven by house fly monitoring results (activity counts). House fly activity can be monitored in many ways. However, most methods described to date are time consuming and require some ability to identify house flies relative to other flies. Because of these limitations, house fly monitoring is not routinely performed at most animal facilities. Please visit our FlySpotter© software page for more information and software download.